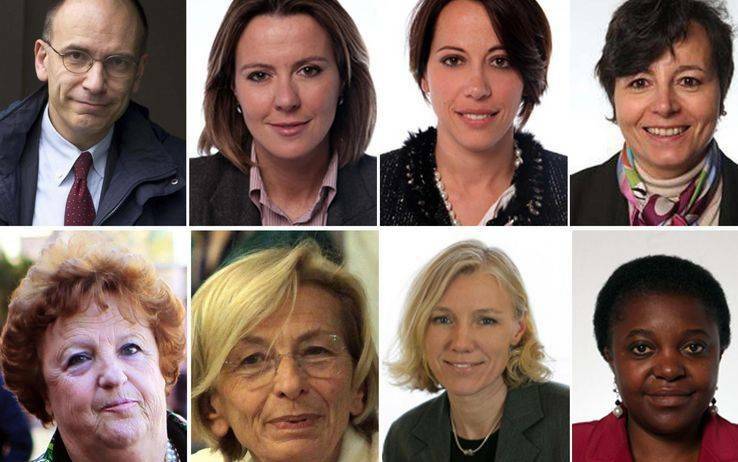 With seven women, the 21-member cabinet of Premier Enrico Letta vaunts the largest number of women of any Italian government in history. Emma Bonino is Italy's only second female Foreign Minister. Anna Maria Cancellieri holds the delicate post of Justice Minister. Two were born outside of Italy: Minister for Integration Cecile Kyenge was born in the Congo while Josefa Idem, the new Minister for Equal Opportunities, Sports and Youth, was born in Germany and holds 38 medals from world sporting competitions including the Olympics. Here they are, in profile. ROME - The good news is that Premier Enrico Letta's 21-member cabinet of ministers, sworn into office by President Giorgio Napolitano on April 26 and confirmed in votes of confidence in the Chamber of Deputies and then the Senate on April 30, has the largest number of women ministers of any of the previous dozens of governments since the birth of the Republic. Although the Letta government is not expected to last the full five-year legislative term (and since WWII only one government has), let us enjoy this female presence as long it lasts, whether nine months, as some predict, or l8 months as others guess. Here they are, in profile. The women in the news begin with the new foreign minister, Emma Bonino, 65, a graduate of Milan's prestigious Bocconi University. She was first elected to Parliament representing the Radical Party 28 years ago and has been secretary of that (now much reduced) party since 1993. Bonino is also a familiar figure in Brussels, where she became European Commissioner for humanitarian aid in 1995, and worked on behalf of victims of the warring Balkan nations. As Commissioner her bailiwick later included consumer health and food safety. She turned her interest to Cairo in 2001, where she began studying Arabic, before returning to Brussels in 2004. Two years later Premier Romano Prodi took her into his government as Minister for European Policies. Among the tough problems she will face in dealings with Brussels, an Italian foreign policy priority, are the rights and responsibilities of immigrants for whom Italy is a gateway to Europe. Anna Maria Cancellieri, 69, is often described as a professional super-bureaucrat. She served as Interior Minister under Mario Monti and is now Letta's Minister of Justice, a particularly sensitive post. In 1973 she was made a prefect with responsibilities for a string of cities stretching throughout Italy from Catania to Bergamo. In 2010 she became special commissioner for Bologna. Serving under Monti, she dissolved 33 local governments for Mafia infiltration, including the prominent Reggio-Calabria city council headed by Berlusconi's Liberty party (PdL). In her new role she is expected to deal with such fraught issues as money laundering, cheating on balance sheets and the spread of political corruption during the past decades. Another challenge will be to revise, if she can, the statute of limitations. "Prescription," as it is called here, has already allowed countless cases to be ended without a judgment because previous governments have reduced the time period before which a trial automatically (and conveniently for the defendant) cancelled. At 37, Nunzia De Girolamo, Minister for Farms, Food and Forests, is the youngest in the cabinet. A lawyer and PdL loyalist, she began her rise to power by organizing Berlusconi's supporters in the Southern Italian town of Benevento, but she is married to an MP from the Partito Democratico (PD). Her legal expertise is in civil rights, labor and commercial law, but for over two years she served on the Agricultural Commission of the Chamber of Deputies. Agricultural policy is a major theme in Italy's dealings with the European Community and involves over $7 billion. Maria Chiara Carrozza, 48 and from Pisa, is Minister for Education, Universities and Research, and was brought to government to represent the Partito Democratico. Carrozza is a noted scientist and a professor of bioengineering at the Sant'Anna University in Pisa, of which she was president. She has also taught at universities in Rome and Vienna. Among the most important tasks she faces: grave cutbacks of funding for schools, universities and research. Salaries for school personnel are considered at risk, and ordinary maintenance of schools is often neglected. Beatrice Lorenzin of the PdL is 41 and Roman, and the fifth woman to become Italy's Health Minister. Although lacking in experience in the sector, she has a strong political background in Berlusconi's inner circle. The ministry is working hard to find ways to apply the massive cutbacks (circa $39 billion) in Italy's national health service first demanded by the last Berlusconi government and ratified under Monti's austerity plan. Among the specific health reform plans likely to generate controversy is to cut back on the number of hospital beds available and to boost patients' payments. Cecile Kyenge (the name is pronounced French style), 48 and an MD, was born in the Congo but is an Italian citizen and today Minister for Integration. Her medical specialty is as an eye surgeon, and she is married with two children. She moved into politics for the PD in Modena in the North and in 2009 became a provincial representative for an international group meeting on cooperation and integration. Since 2010 she had been an advocate for Primo Marzo, an organization which attempts to protect the civil rights of migrants. This is her first season as a member of parliament. The disturbing news is that her appointment triggered a host of nasty racist insults. Josefa Idem, 49, of the PD is a world Olympics champion in kayak racing and is the new Minister for Equal Opportunities, Sports and Youth. Born in Germany, she holds 38 medals from international sports competitions and participated in the eight Olympics competitions between 1984 and 2012. Her governing experience was strengthened, say her supporters, by six years as sports commissioner for the town of Ravenna, and she has served on a Ministry oversight committee that dealt with dumping. As minister she will have to address cut-backs on previously planned spending on sports activities for Italian youth and, above all, on curtailing planned construction of new sports facilities and arenas.